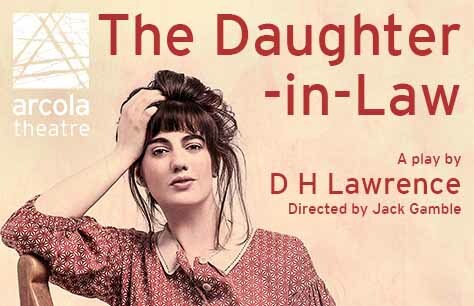 Following a sold-out first run, and three Off West End award nominations, The Daughter-in-Law transfers to Arcola Studio 1 for four weeks only. D H Lawrence’s groundbreaking play, never performed in his lifetime, entwines the struggles of a young married couple with those of a community on strike. In Nottinghamshire, 1912, trouble is brewing in the mines – and simmering closer to home. When Mrs Gascoyne discovers an explosive secret about her newly-married son, it risks the hard-earned security of her daughter-in-law. But Minnie Gascoyne isn’t going to settle without a fight. Jack Gamble’s in-the-round staging tears down the walls of the Gascoyne family home, and exposes Lawrence’s remarkable characters to a world approaching boiling point. Children under the age of 12 are not permitted. Please note: the access lift at the Arcola Theatre is currently out of order- for additional information please call the box office. Extremely interesting early 20th century sexual politics from D.H. Lawrence, by modern standards a little simplistic perhaps but delivered with enormous panache and of its time. Expert attention to Nottinghamshire dialect and idioms can take a while to tune into, but some gems if you catch them (again, mostly offensive to modern sensibilities). Terrific performances all round, powerful stuff.